The bridge on the Northern Expedition ferry showcases a display of more than fifty different knots from one of its longest serving employees. Roy Spletzer is a bit of a knot connoisseur. There are at least 4,000 different types of knots in the world, and he’s tied more than 1,800 of them. “I started with my dad because my dad used to be a scout leader and he’s a survivalist kind of guy. You’d go out in the trees and he’d be tying stuff up,” said the soft-spoken man from inside the bridge surrounded by windows that offer views of the harbour. His parents moved to Prince Rupert when he was in his early 20s working on oil ships in the Arctic. When his dad fell ill, he left camp to be with him. While he was in the city he applied for a job with BC Ferries, so that he wouldn’t have to go away for nine months at a time. As a deck hand he had to tie certain knots. Now, more than 30 years later of working for BC Ferries, he’s the bo’sun, the ship’s officer in charge of the crew and equipment, and he makes sure his crew know how to tie six key knots. The most important, he said, is the bowline. “Because that one will save your life more times than not,” Spletzer said. With any regular knot if someone falls in the water and a rope is tossed to them when the person is pulled up the knot slips and tightens up on the person’s body. He described that the bowline won’t slip down the line and stays in place. His own life was once threatened on March 22, 2006 at 12:22 a.m. when the MV Queen of the North crashed into Gil Island. He said that time always sticks in his mind. “I woke up and my room was full of water. I thought I was going to die, drown, because everything broke and the water came down into my room,” he said. Two people died that night and the fourth officer, who was in charge of the ship when it crashed, was found guilty of criminal negligence. After reflecting on that dark moment in his past, he lights up again when he talks about the incredible wildlife he’s seen over the years travelling through the Inside Passage to Port Hardy or crossing over to Haida Gwaii. This summer he saw humpback whales bubble feeding beside the ship when they were in Klemtu. Spletzer’s hobby is making knot boards, such as the one displayed on the Northern Expedition bridge, for the challenge and to teach others about the fading art. He said the knot board on the ship took him only 10 hours to tie because he ties them so often. Now, his 29-year-old son wants him to make one for his place. The ornamental knots he ties originated on the old sail ships when it would take months to get from England to China and back. To pass the time, sailors would tie knots. “I have a book at home. I could make you a pair of shoes. I could make you a rope. I could make you belt. It’s all just done with knots,” Spletzer said. 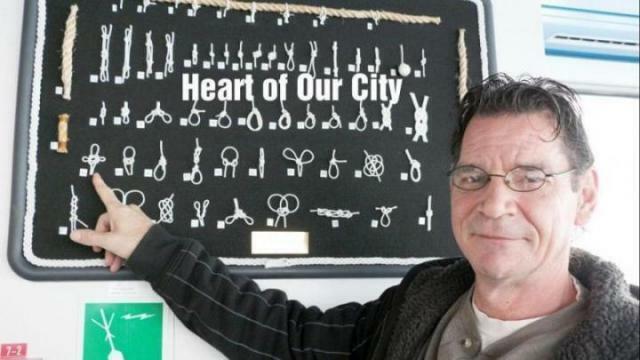 He once made a knot woven into an anchor and it took him 300 hours to finish. “This is a dying art. Not many people do it anymore just because we don’t have sail ships. Everything is done with bigger rope and with winches. Back on the sail ship everything was done by hand,” he said. Then he offered a history lesson. The original rope was made from coconut husk woven together. Modern rope, such as what he uses for his knot boards, is made of a synthetic polyester line. Spletzer said he doesn’t have one favourite knot, but he enjoys the ones he can’t tie — he loves a challenge. Being a BC Ferries employee based in Prince Rupert has had some perks over the years. He gets two weeks on and two weeks off, which he usually spends on the North Coast or in the Okanagan. Retirement is on the horizon. He plans to go to Kelowna, where he spent his youth, and he wants to golf and see the world. “I haven’t done that yet,” he said adding that he’s seen a lot of Canada but he’s never been outside of the country.